Sempra Energy's management has shied away from its more diverse background and is concentrating on its more lucrative opportunities. One of the more unique companies in the utility industry is Sempra Energy (NYSE:SRE). Unlike many other utilities that stick to their knitting by investing in their regulated businesses and cashing in on approved rate hikes, Sempra has diversified both geographically and into new divisions. Some of those moves haven't turned out so well, and now the company is trying to refocus on its two biggest opportunities: regulated utilities and exporting natural gas. This past quarter, the company made a few moves to get closer to becoming what management envisioned. Here's a brief look at Sempra Energy's most recent earnings and what investors should make of this transformation. 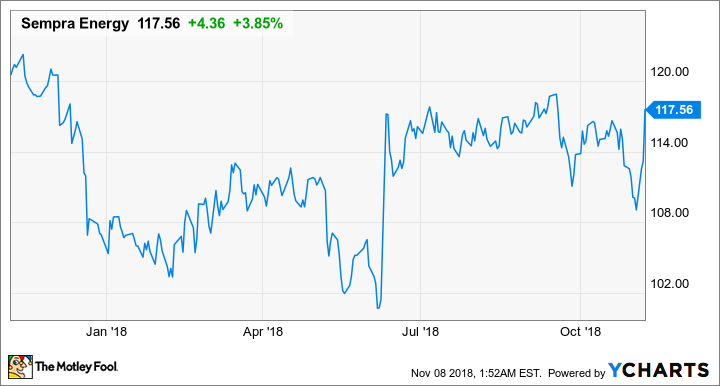 For a utility company that typically puts up consistent numbers each quarter, Sempra's results have been uncommonly volatile, and not just because its natural gas distribution business is seasonal. The company has had several charges and writedowns hit the bottom line as it goes through a restructuring. This quarter was the first one where we got to see the benefits of its Oncor acquisition as well as no charges or writedowns. Data source: Sempra Energy. Chart by author. What is perhaps more important than the earnings numbers were management's recent moves to refocus the company on electric transmission and distribution and liquefied natural gas (LNG). Sempra announced that it sold a large portion of its U.S. solar and wind generation assets to Consolidated Edison for $1.54 billion. It then took the proceeds from that sale to acquire electric transmission real estate investment trust InfraREIT (NYSE:HIFR) for $1.275 billion, as well as a 50% interest in transmission and substation specialist Sharyland Utilities. These deals are designed to increase the company's Texas utility footprint after acquiring Oncor earlier this year. The other news this past quarter was that Sempra signed tentative sales deals for the full export capacity of its Energia Costa Azul (ECA) LNG export terminal in Baja California, Mexico. Also, in conjunction with that agreement, the company signed a Memorandum of Understanding with integrated oil and gas company Total (NYSE:TOT) where Total will buy 9 million tons per year from Sempra's multiple LNG terminals, including ECA and phase two of its Cameron LNG terminal. Phase one for the terminal started the commissioning phase and expects to be operational by the middle of 2019. On the company's conference call, CEO Jeff Martin's prepared remarks addressed how the company is progressing with its restructuring and how these recent moves fit into the overall plan. I'm pleased to say we continue to make great strides with our vision to become North America's premier energy infrastructure company. An integral component of that vision is our commitment to continue to improve the visibility of our T&D [transmission and distribution] earnings mix, which we were able to do through our recently announced Texas acquisitions. These transactions require no incremental equity and we expect to fund them with a portion of the proceeds from our announced US solar portfolio sale. Furthermore, we're continuing to make progress on the sale of our US wind and certain US midstream assets as originally announced in June. We are currently engaged in an active sales process with very strong initial market interest. Lastly, we are continuing to strengthen our balance sheet. We plan to pay down parent debt with a portion of the proceeds from the announced asset sales and the settlements of our common equity forwards. You can read a full transcript of Sempra Energy's conference call here. The most encouraging thing in Martin's statement above is that the company intends to use a large portion of its upcoming asset sales to pay down debt. Debt has been slowly building on the company's balance sheet for some time as it builds out its Cameron LNG facility, and it is becoming a significant drag on the bottom line. By shedding the rest of its renewables, the company will become slightly more focused. It will, however, still have a rather scattered footprint of assets varying from electric and gas utilities in North and South America, a portfolio of LNG terminals, and an energy infrastructure developer in Mexico. What matters more than anything else right now is getting Cameron LNG up and running. Once that is operational, it should provide a significant boost to earnings and cash flow that will make the company's current debt load look much more manageable. With so many moving parts, though, it may be worth waiting on the sidelines until Sempra completes all of these deals and we can see what the results of those moves look like on its income statement.